Just be glad you’re not a Spanish learner from 100 years ago. Back then, translation was the primary method of foreign language instruction in much of the Western world. And it wasn’t always fun. Usually you’d get a grammar rule, then some sentences that use the rule to translate. Since then, translation-centered methodologies have largely fallen out of favor. And it’s true that other techniques such as language immersion can have massive benefits for Spanish learners. But many linguists and educators still feel that translation is an essential part of foreign language learning. When done right, it can be extremely useful for vocabulary recall and grammar practice. 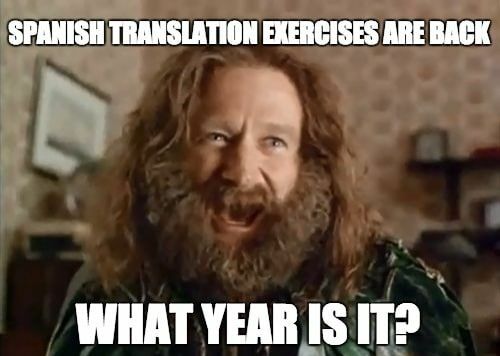 The thing is, there’s no need to kick it old school with dry, unexciting translation drills. Today, thanks to the magic of the internet, there are several resources for DIY translation exercises using real-world Spanish. We’ll show you our favorites below, including everything from Spanish recipes to captivating literature to explorations on Google Maps. I’ve had many Spanish teachers tell me that in order to learn Spanish, I should stop translating to English and focus on “thinking in Spanish.” This is good advice, for sure—but Spanish learners should also appreciate the importance of translation exercises, too. When you sit down to translate a text from English to Spanish, you learn to pay attention to the way that native speakers write. How do they construct their sentences? What words do they choose and what colloquial expressions do they use? Do these phrases have English equivalents? Asking yourself these questions can help you quickly improve your Spanish writing and comprehension. Plus, you’ll learn to think about Spanish sentence-by-sentence rather than word-by-word, which will make your own Spanish writing and speech sound more natural. Translation exercises are also great for learning and reinforcing vocabulary. You know those words you see or hear all the time, but never quite remember the meanings of? Well, when you’re doing a close translation exercise, you’ll have no choice but to learn them. And trust me, after looking them up in a dictionary a few times, you’ll never forget them. One key to fun, engaging, memorable translation exercises is choosing interesting material. By using authentic passages written by and for native speakers, you can practice Spanish and also learn about a topic that appeals to you. Spanish-speakers of all levels, from absolute beginner to advanced, can find “real-world” texts to translate rather than relying on textbook exercises. As noted above, these types of engaging, real Spanish materials are exactly what we’ll point you to in this post. Another key to enjoying translation exercises is to avoid getting bogged down in unfamiliar vocabulary. Instead of consulting a dictionary every time you come across a word you don’t know, flag those words and come back to them later. When I’m translating, I like to use a blank space, a star or a question mark to indicate a word I’m not sure about. Later, once I’ve translated the bulk of the paragraph, I come back and use context clues or a dictionary to fill in the gaps. Finally, it’s important to choose a text at the correct difficulty level. Choose a text that’s too easy and you won’t feel challenged. But a text that’s too difficult might leave you feeling overwhelmed. In the list below, I’ve indicated the difficulty level for each resource so that you can choose an appropriate one for yourself. The resources in this list were chosen because they have built-in Spanish and English translations. This allows you to “self-grade” your translations by simply looking at the English text provided. Want further guidance? Consider posting your translations to a website like Lang-8, where a native speaker can read your work and weigh in. You can also post your translations to a language-learning forum like the ones at WordReference or r/Spanish on Reddit. Oregon State University and the USDA’s Food Stamp Program have provided a series of fun, simple, illustrated recipes available in both English and Spanish. They weren’t intended as translation exercises, of course—but they make surprisingly good ones. Each recipe includes an ingredients list followed by step-by-step instructions in picture and text form. The recipes appear first in Spanish and second in English. I’ve found three sets of pictorial recipes: try a breakfast burrito or spicy rice casserole, some ginger muffins and cookies and wash it all down with agua fresca de fruta (fruit slush). These make great translation exercises for early beginners, due to their short sentence structure and easy-to-understand food vocabulary. Plus, the pictures can help beginners figure out more difficult words. Laura at The Spanish Blog has written extensive city guides for various Spanish cities. Alongside the most famous tourist destinations like Madrid and Barcelona, she has also written about lesser-known Spanish cities like Oviedo and Cuenca. The city guides are broken into five parts, each explaining a different aspect of the city’s culture or heritage. Each part is presented first in Spanish and then below in English, so you can simply translate the Spanish and then scroll down to check your translation. Because these city guides rely on familiar vocabulary, factual information and present-tense verbs, they make good translation exercises for beginner to upper-beginner speakers. As a former inhabitant of beautiful Cáceres, I recommend starting with this article on cacereño cuisine. Driving directions can help beginner learners practice important vocabulary, as well as command conjugations for verbs. Luckily, Google Maps makes it easy to toggle between languages. Click on the horizontal lines at the upper lefthand corner of the page and then select “Language” from the dropdown menu. There, select español (either European or Latin American—your preference). Then, search for directions to somewhere in your town or city. The repetitive nature will help you learn vocabulary for directions (left, right, straight, turn, continue, etc.) quickly and efficiently. Get started with an area that’s familiar to you, then try exploring a Spanish-speaking country you’ve always wanted to visit! Paralletext.io offers a selection of famous texts in many languages. On the website’s home screen, you’ll see the prompt “I speak.” Choose English. Then, you’ll see “I would like to get better at.” Choose Spanish. This will bring you to a list of many classic texts by authors like Jane Austen, Cervantes and Jules Verne. When you choose a book, you’ll see the work entirely in Spanish. When you move your mouse over a paragraph of text, you’ll notice two arrows in a circle appear to the left of the paragraph. Click on these arrows to toggle between English and Spanish. When translating, you can go paragraph-by-paragraph or do larger chunks at a time before checking the English translation. Since these are novels, you shouldn’t necessarily expect to have the same word-for-word translation that appears on the website—a lot will depend on interpretation and poetic license. Instead, focus on confirming that you understood the general idea and essential words of each sentence. Creative writing translations can be tricky, so this resource is best for upper-intermediate to advanced learners. Intermediate learners can make this resource work for them by picking a text that they’re already familiar with in English. If you’re more interested in news than novels, check out Dual Texts. This website features timely news articles as well as cultural commentary in a convenient bilingual format. When you click on one of the articles, you’ll see the English text on the left and the Spanish translation on the right. Ignore the English at first and just read through the Spanish. Again, you can translate paragraph-by-paragraph and then check the English translation or try to get through the entire article in one go. These texts are appropriate for learners at an intermediate level. I recommend the article “Anglicisms” for an interesting discussion of linguistic exchanges between English speakers and Spanish speakers. AlbaLearning offers an extensive collection of parallel texts, including both novels and short stories. To find a good translation exercise, look for a text that features a Spanish flag as well as a U.S./U.K. flag—this indicates that it’s offered in both English and Spanish. Much like Dual Texts, this website displays the Spanish text and the English text alongside each other. You just have to cover the English side while you’re doing your translation. AlbaLearning’s parallel texts vary in length and difficulty level. For an intermediate speaker, I would recommend “The Princess and the Pea,” since it’s quite short and the story is familiar to most people. A more advanced learner could try to tackle Cervantes’ “The Spanish-English Lady,” which is quite long but is broken into five manageable sections. Are you an art enthusiast? Why not try translating the educational and informative website of the Museo del Prado in Madrid, Spain? Many individual pages on the website can be easily toggled between English and Spanish via the “ES/EN” button in the upper righthand corner. Plus, the website’s translations are generally pretty close to the original Spanish in terms of vocabulary and sentence structure. Some examples are the various descriptions of the museum’s collections and the briefs about upcoming exhibitions. Even if you have no intention of visiting the Prado, you still might enjoy reading the Spanish version, translating a paragraph to English and then checking your translation. Since the vocabulary can be somewhat complicated and specific, this exercise is best for intermediate to advanced learners. Pro tip: lots of tourism-related websites are translated into multiple languages, so if you finish with the Prado website—or if art just isn’t your thing—you can also try this with other websites for museums, national parks, hotels or historic sites. Whether you’re a new learner, gogint to an Spanish immersion program in Costa Rica, or an advanced Spanish reader, it’s not hard to find online resources for a DIY translation exercise. Besides practicing your Spanish after our language school in Costa Rica, you may even learn something interesting about art, food, culture or news in the process of translating.